“Relations between Soviet Russia and computers were always a bit obscure, especially, when it comes to foreign models, not officially exported in Russia. But, if one wants trace the roots of Russian demoscene, especially on spectrum, one should dig into 80’s, when the first generation of radio amateurs built their first machines. A very popular magazine Radio had main role in this development, through years of existence this magazine gathered a lot of talented people, trying to invent something, using available elements to bring technology closer to people. By the mid 80s Soviet Russia had various models of computers, but none of them were cheap enough to be affordable for average soviet family. Only institutes and other studying facilities had an opportunity to own computerized classes, sponsored by national budget. In 1983 “Radio” published schematics of Micro-80 computer, which became one of the first machines, available for the people to construct themselves. The main drawback of this schematics was a big number of components – more than 200, this fact complicated the possibility to build “Micro-80” for average radio amateur, because a lot of elements were hard to find in normal stores, only on black market. Of course, some progressive minded people already knew about home computers in Europe, which everyone could buy. Even iron curtain couldn’t stop the flow of information about modern technologies. Some people already had computers, brought through the border as contraband. 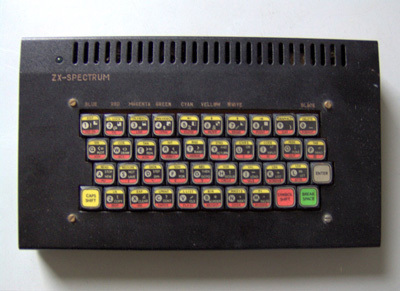 No wonder, ZX-Spectrum reached Russia more often, as it was cheaper to buy. By the end of 1984, engineers in several institutes already had schematics of this machine and been trying to copy it, using only Russian parts. It was a hard task, because of ULA chip, which formed a video image on the display and was too complex to hack and copy. Anyway, as the story says, engineers from the Ukrainian city Lvov were the first to fulfill this task and build a working machine in the August of 1985. Schematics, they designed, became very valuable information, so they could trade it to the researchers in other cities for knowledge on other topics, being in development. Still, this remained unknown to the public and only limited amount of people actually knew about the existence of a cheap home computer with colorful graphics, which any radio amateur can build himself. For example, even in 1986 “Radio” magazine was still publishing the schematics of Radio-86RK – computer, which consisted of 29 parts, but again had only black and white text mode. 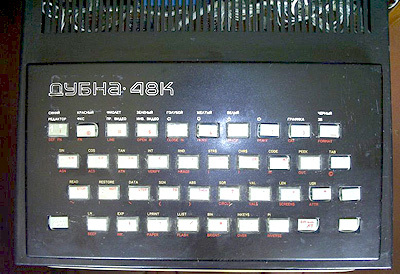 Despite this, it became first very popular machine in Russia – some games and utilities started to appear, all done by homebrew programmers. Two more years became necessary for ZX-Spectrum 48 production facilities to appear in almost every large city. No one had ever heard the word “copyright” back then and producing a hacked English computer never counted as a crime. More to say, many manufacturers changed or optimized schematics and gave the computer the name they wanted. This is how “Dubna”, “Moscow”, “Leningrad”, “Delta” and about 40 more models appeared. Some were very similar to each other some contained a lot of changes, even custom built-in RAM routines. For example, they could have Russian font, debugger and turbo loading procedures, loosing in the same time some compatibility with original programs, written for speccy. Software was not a big problem either – traders traveled to socialistic European block, countries like Czechoslovakia and Poland, where cracking groups already existed and a way of transmitting cracked software through FM radio channels, so one could easily get any programs. First Polish demos reached Russia that way. As far as I know, in the beginning of 1990s some Russian coders decided that they are better than Poland ones, so they made demos themselves. While making those simple demos with ripped from games tunes, no one really understood, they are becoming a part of something much bigger, than just a circle of several friends with ZX-Spectrum in their home city. They didn’t know the word “demoscene” at that time, but in fact, they were the first wave of this cultural phenomena that would spread here a few years later. Very soon appeared first magazines, mainly about games and programming. As there was nothing to crack all the games had been already cracked by Polish guys, coders started to make Russian versions of games and add intros to it. The text above is an excerpt from an article written by Elfimov ‘Elfh’ Konstantin for Mustekala. Read the whole article here. Thanks to Mustekala for permission. Elfh is a remarkable ZX Spectrum demoscener. During the years he has published quite a number of outstanding demos. And I’m proud to tell you he has recently joined the staff of 8bit today as an editor. With texts from the same article, I’d like to show 3 recent demos done by Elfh.